The beauty of a coral reef, the warm radiance of sunshine, the sting of sunburn, the X-ray revealing a broken bone, even microwave popcorn—all are brought to us by electromagnetic waves. The list of the various types of electromagnetic waves, ranging from radio transmission waves to nuclear gamma-ray (γ-ray) emissions, is interesting in itself. Even more intriguing is that all of these widely varied phenomena are different manifestations of the same thing—electromagnetic waves. What are electromagnetic waves? How are they created, and how do they travel? How can we understand and organize their widely varying properties? What is their relationship to electric and magnetic effects? These and other questions will be explored. If a changing electric field is generated, then a magnetic field is induced, which results in a changing magnetic field that induces an electric field, and the cycle continues. To prove it, let's look at an object that can produce electromagnetic waves and transmit them through the air: an antenna. ​This antenna is made up of two conducting rods, each attached to opposite ends of an AC generator. When the antenna is operating, the two rods switch between being positively charged and negatively charged, as the generator changes voltage. And when one rod is positively charged, the other is negatively charged and vice versa. When the electric current travels up into the top of the rod, you can use the right hand rule, pointing your thumb in the direction of the current, to see how the magnetic field flows around the antenna. The electric fields generated by the antenna itself are easier to track, since they'll just go from the positive rod to the negative rod. But as the direction of current switches, the direction of both the electric and magnetic fields change. And as the rods switch their charges, the waves generated by the initial charge distribution continue to propagate away from the antenna. So if you were standing away from the antenna, you would be able to measure an electric and magnetic field that are both constantly changing. But what would that look like? To grasp the effect of changing fields in motion, let's model an electromagnetic wave as it travels through 3-dimensional space. NOTE: The dimensions of the antenna are critical for determining the frequency of the radiated electromagnetic waves. This is a resonant phenomenon and when we tune radios or TV, we vary electrical properties to achieve appropriate resonant conditions in the antenna. An antenna for receiving EM signals works in reverse. And like antennas that produce EM waves, receiver antennas are specially designed to resonate at particular frequencies. We will look at resonance in more detail in future modules. First, note that the wave is traveling in the x-direction. Now, plot the electric field oscillating back and forth in the y-direction. The electric and magnetic fields always act perpendicular to one another, so the magnetic field will oscillate in the z-direction. Note that the electric and magnetic fields both peak at the same time so they are in phase. These waves are called traverse waves because the electric and magnetic field oscillations act in directions perpendicular to the direction of motion. Static charges and currents produce fields that die away as 1/r^2. However time varying charges and currents can radiate electromagnetic waves. Waves are produced by accelerating charges. Oscillating charges are a special case of accelerating charges (see animation below which is basically how radio broadcasting antennas work - though charges oscillate in much more complicated ways to encode the music). When you have a varying (time dependent) electric field you'll have a magnetic field going around it, where the magnetic field B is proportional to the rate of change of the electric flux. And that induced magnetic field will itself be time varying and will produce an electric field going around it. So basically the electric and magnetic fields wind around each other whenever they are dependent on time and they free themselves from the (broadcasting antenna for example). and take off, the way a soap bubble floats away from the ring it is initially attached to. 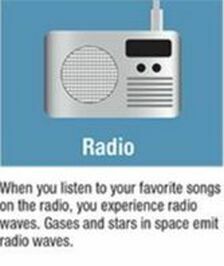 The waves reach your radio and set the electrons in your antenna in motion, assuming your circuit is tuned properly. Thus the waves and their sources are really like you and your parents. At some point you are free from your parents; you are able to manage on your own. The electromagnetic waves can go on their own but they are not produced on their own, they are produced from time varying charges and currents. How fast are these waves moving? 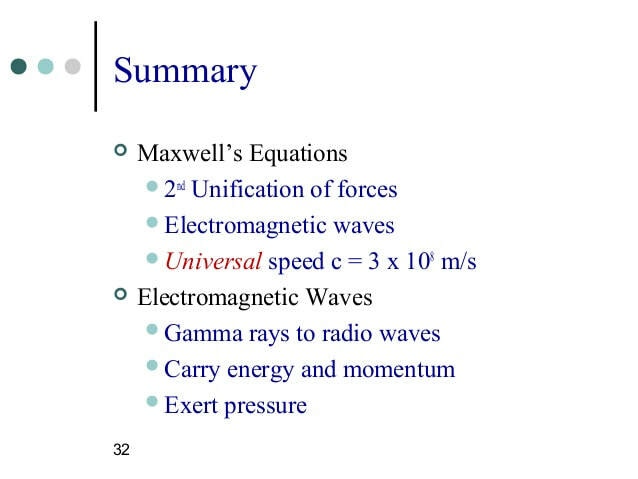 Maxwell calculated that the speed of each wave is equal to the electric field's magnitude divided by the magnetic fields magnitude. This equation simplifies down to an equation with two constants, the permittivity of free space for electric fields, and the permeability of free space for magnetic fields. And this speed works out to be 3x 10^8 meters per second. We write it simply as small c, and it's the speed of every electromagnetic wave, ever, at least in a vacuum. You may know it better as the speed of light, after all light is an electromagnetic wave. The implication is astounding: Perhaps LIGHT is an electromagnetic wave. Of course the conclusion does not surprise anyone today, but imagine the revelation in Maxwell's time!! eo and uo came into the theory as constants in Coulombs Law and the Biot Savart Law respectively. You measure them in experiments with pith balls, batteries and wires - experiments which have NOTHING to do with light. And yet, according to Maxwell's theory, you calculate c, the speed of light from these two numbers. So now we have a new understanding of what light is. It is simply made of electromagnetic waves traveling at speed c. It consists of varying electric and magnetic fields. So you measuer eo and uo from magnetostatics, throw in Maxwell's displacements current for consistency, and out comes a wave, which turns out to be a description of LIGHT!! It doesn't get any better than that in the world of Physics. We won't derive further equations for electromagnetic waves because it gets a little hairy in 3 dimensions. But the principles are essential similar to our simple 1D wave we discussed early. But the simplest ones are monochromatic (1 frequency sinusoidal) plane waves. But are the solutions to the 1D plane wave and the Animation below Illustrates this solution. You can see the Electric field produces the magnetic field and the magnetic field produces the electric field and it goes on forever through energy conservation (or until absorbed). There are microwave photons from the big bang itself we can still detect 13.8 billion years LATER!!! Every electromagnetic wave carries energy through space, and can reflect off some material, while passing through others. But visible light is just one small part of what's known as the electromagnetic spectrum. Like waves in the ocean, electromagnetic waves can vary in their wavelength, amplitude and source. Remember from module 1, the wavelength is the distance between the peaks of a wave and the frequency is how many times a wave peaks in a given second. A waves speed is equal to its frequency times is wavelength. If you multiply these you'll see it comes out to m/s. And since the speed of light is constant you can easily find the frequency if you know the wavelength and vice versa. There are many types of waves, such as water waves and even earthquakes. Among the many shared attributes of waves are propagation speed, frequency, and wavelength. These are always related by the expression v=fλ. This module concentrates on EM waves, but other modules contain examples of all of these characteristics for sound waves and submicroscopic particles. As noted before, an electromagnetic wave has a frequency and a wavelength associated with it and travels at the speed of light, or c. The relationship among these wave characteristics can be described by vW = fλ, where vW is the propagation speed of the wave, f is the frequency, and λ is the wavelength. Here vW = c, so that for all electromagnetic waves, c = fλ. This figure shows how the various types of electromagnetic waves are categorized according to their wavelengths and frequencies—that is, it shows the electromagnetic spectrum. Many of the characteristics of the various types of electromagnetic waves are related to their frequencies and wavelengths, as we shall see. 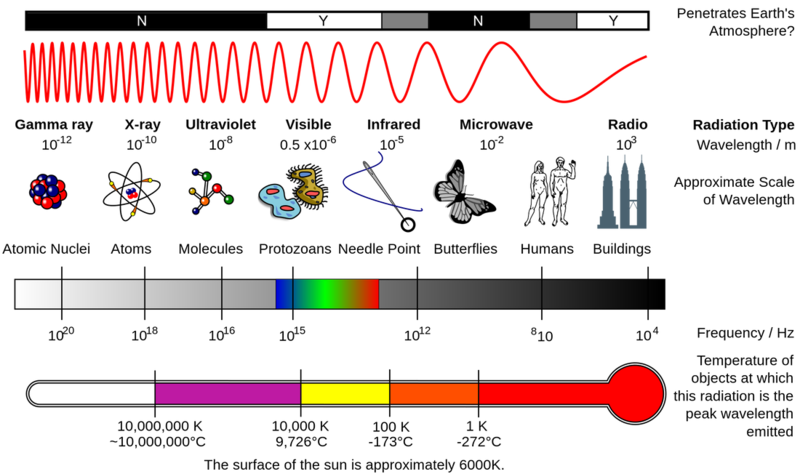 ​Below is the Full Range of the Electromagnetic Spectrum. The light you and I see has a very limited range of possible wavelengths, roughly between 400 and 700 nanometers. On the shorter side are ultraviolet light and Xrays, on the longer side are infrared and radio waves. These are all electromagnetic waves only differing in frequency (or wavelength). The prefex ultra and infra refer to the frequent. Ultraviolet is literally "above" violet. Infrared is literally "below" red (in frequency). Visible like is an example of EM waves as is gamma, x-ray, UV, IR, microwave and radio waves all of which can be further broken down into subgroups. All these classifications are based on FREQUENCY!! Some 73 Octaves of Frequencies from low ELF to Gamma Rays. Visible Light is only a Narrow Sliver in this Vast Spectrum!! But it turns out to be the PEAK output of our Sun, showing how our eyes and life adapts to Nature. As we mentioned in the last Section the Human body is transparent to a magnetic field so penetration depth is much easier to calculate because there is no frequency and tissue dependent impedances or dielectrics to deal with. Low Frequency PEMFs go into and through the body without being blocked, slowed down, or used up. All tissues in the body are equally transparent to a PEMF. The broad category of radio waves is defined to contain any electromagnetic wave produced by currents in wires and circuits. Its name derives from their most common use as a carrier of audio information (i.e., radio). The name is applied to electromagnetic waves of similar frequencies regardless of source. Extremely low frequency (ELF) radio waves of about 1 kHz are used to communicate with submerged submarines. The ability of radio waves to penetrate salt water is related to their wavelength (much like ultrasound penetrating tissue)—the longer the wavelength, the farther they penetrate. Since salt water is a good conductor, radio waves are strongly absorbed by it, and very long wavelengths are needed to reach a submarine under the surface. NOTE: The safest and BEST PEMF devices operate in the ELF range of frequencies but the ENERGY from PEMF is VERY different than Radio Waves. This is a COMMON source of confusion amongst not only consumers but so called PEMF experts. I have seen Dr Pawluk and many others many this error. The mistake comes from NOT understanding Physics, which is why I am doing this course. We will see why this is so in Section 2 of the Course, but it has to do with the Difference between Magnetic Fields, Electric Currents, Electric Fields and Electromagnetic Waves. Or to be more technical with respect to PEMF, the pure pulsating magnetic fields result from the velocity fields of solutions to Maxwell's Inhomogeneous wave equations. ONLY the acceleration fields RADIATE away in the form of Electromagnetic waves. In a nutshell, PEMF penetrates deeper and has MUCH more potent healing effects the ELF radio waves. That is, if you took a 7.83 Hz radio wave it would not have much effect on the human body, BUT a 7.83 PEMF signal is INCREDIBLY HEALING and powerful. More on this later. How does the ubiquitous microwave oven produce microwaves electronically, and why does food absorb them preferentially? Microwaves at a frequency of 2.45 GHz are produced by accelerating electrons. The microwaves are then used to induce an alternating electric field in the oven. Unfortunately even though fast and convenient, IT IS NOT HEALTHY!!! In my book I talk about the dangers of Microwave ovens and 4G and Now 5G networks which are also Microwave frequencies. More on this in Section 3, where I will have a video on electrosmog. Infrared radiation is generally produced by thermal motion and the vibration and rotation of atoms and molecules. Electronic transitions in atoms and molecules can also produce infrared radiation. Water molecules rotate and vibrate particularly well at infrared frequencies, emitting and absorbing them so efficiently that the emissivity for skin is e = 0.97 in the infrared. Night-vision scopes can detect the infrared emitted by various warm objects, including humans, and convert it to visible light. Ultraviolet means “above violet.” The electromagnetic frequencies of ultraviolet radiation (UV) extend upward from violet, the highest-frequency visible light. Ultraviolet is also produced by atomic and molecular motions and electronic transitions. The wavelengths of ultraviolet extend from 400 nm down to about 10 nm at its highest frequencies, which overlap with the lowest X-ray frequencies. 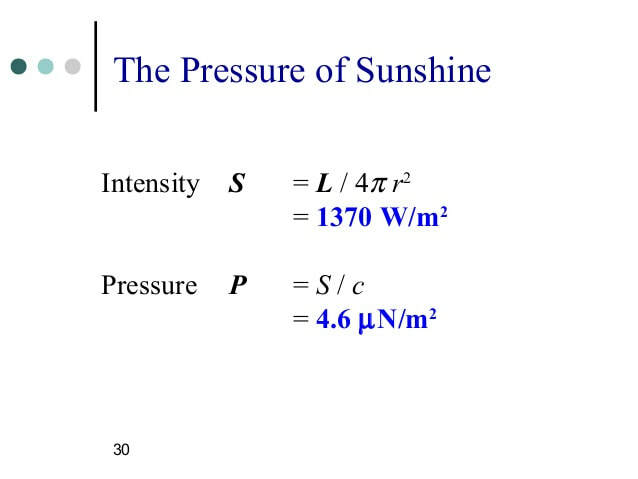 Solar UV radiation is broadly subdivided into three regions: UV-A (320–400 nm), UV-B (290–320 nm), and UV-C (220–290 nm), ranked from long to shorter wavelengths (from smaller to larger energies). Most UV-B and all UV-C is absorbed by ozone (O3) molecules in the upper atmosphere. 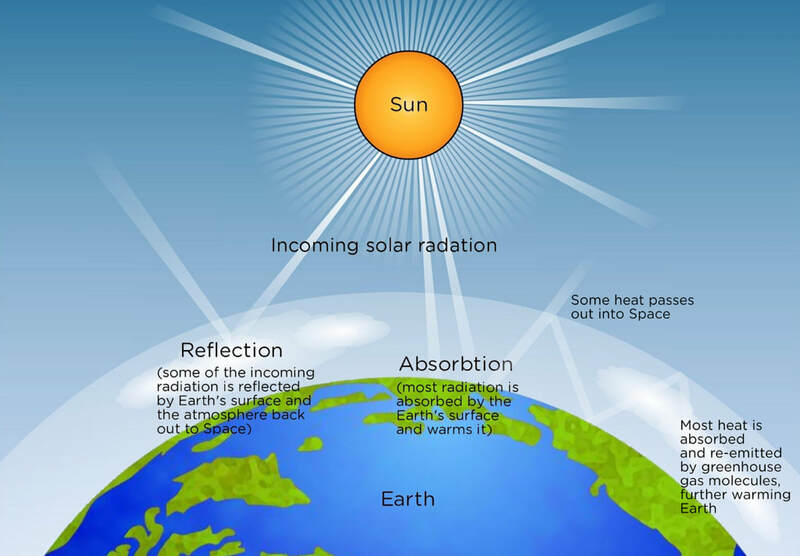 Consequently, 99% of the solar UV radiation reaching the Earth’s surface is UV-A. X-RaysIn the 1850s, scientists (such as Faraday) began experimenting with high-voltage electrical discharges in tubes filled with rarefied gases. It was later found that these discharges created an invisible, penetrating form of very high frequency electromagnetic radiation. This radiation was called an X-ray, because its identity and nature were unknown. The use of X-ray technology in medicine is called radiology—an established and relatively cheap tool in comparison to more sophisticated technologies. Consequently, X-rays are widely available and used extensively in medical diagnostics. Soon after nuclear radioactivity was first detected in 1896, it was found that at least three distinct types of radiation were being emitted. The most penetrating nuclear radiation was called a gamma ray (γ ray) (again a name given because its identity and character were unknown), and it was later found to be an extremely high frequency electromagnetic wave. In fact, γ rays are any electromagnetic radiation emitted by a nucleus. This can be from natural nuclear decay or induced nuclear processes in nuclear reactors and weapons. The lower end of the γ-ray frequency range overlaps the upper end of the X-ray range, but γ rays can have the highest frequency of any electromagnetic radiation. Low ELF, Earth Frequency signals (secondary effect low frequency PEMF devices). Better to Get as a PURE PEMF. Radio Frequencies (RF) - Rife, Gas Plasma Devices. Don't need in my opinion. Microwave - Mainly electrosmog, though diathermy low end microwave. Not safe. Far, Middle Infrared - Sauna Therapy/Heat Therapy/Detox (quality of heating elements, electrosmog, nontoxic. Great for Detox. Near Infrared / Red Light - Red Light Therapy. Power Output and Frequency and Area covered. Great for ATP, Circulation, healing (though PEMF better). Higher frequencies than UVB are ionizing and dangerous. BEST NATURE INSPIRED Electromagnetic Wave Devices (Light Therapy) - RED/NIR infrared, Far Infrared Sauna/Pad. Heliotherapy (Sunbathing). Low Blue Lights Night, Full Spectrum Lighting Day. All these devices give us what we are missing from being indoors too much. The electromagnetic wave is traverse. This just means the oscillation is in the plane perpendicular to the direction of propagation. If you wiggle a taut string tied to a wall, the wiggle will move toward the wall with a displacement in a plane perpendicular to the direction of propagation. So that too is a traverse wave. On the other hand sound waves are longitudinal. The air molecules set in motion (by my diaphragm when I speak move back and forth along the direction of the wave. EM waves are traverse waves which means that the electric and magnetic fields change or oscillate in a plane that is perpendicular to the direction of propagation (and also note the electric and magnetic field in an EM wave are perpendicular to each other. A perfectly polarized plane wave is hard to find. The light from the bulbs in our homes is a chaotic mixture of polarizations, frequencies and phases. Plane waves are an idealization. The light from a source goes out spherically but far from the center, it appears planar over small areas (like the earth seems flat in your area). Because electric and magnetic fields change in a plane that is perpendicular to direction of wave propagation, the direction of change still has some freedom... Linearly and circularly polarized. Electromagnetic waves can bring energy into a system by virtue of their electric and magnetic fields. ​These fields can exert forces and move charges in the system and, thus, do work on them. If the frequency of the electromagnetic wave is the same as the natural frequencies of the system (such as microwaves at the resonant frequency of water molecules), the transfer of energy is much more efficient. A wave’s energy is proportional to its amplitude squared (E^2 or B^2). This is true for waves on guitar strings, for water waves, and for sound waves, where amplitude is proportional to pressure. In electromagnetic waves, the amplitude is the maximum field strength of the electric and magnetic fields. where c is the speed of light, ε0 is the permittivity of free space, and E0 is the maximum electric field strength; intensity, as always, is power per unit area (here in W/m^2 = Watts per meter squared). where B is the maximum magnetic field strength. The intensity I, is defined to be watts per meter squared. That is energy per second per unit area. If you have a frame one meter by one meter and hold it perpendicular to the wave, I is the number of Joules crossing it per second. That's easily calculated from the energy density. The wave that passes my one meter^2 frame in one second occupies a volume of 1 * c * m^3 (where c is the speed of light). The the energy is u*c.
The Poynting vector gives the average intensity I and also the direction of propagation. At the surface of the earth the sunlight brings roughly I = 1000 Watts/m^2. That is pretty amazing: Over the entire surface of the earth facing the sun, it is pumping in 1000 joules per square meter every second!! The sun is 93 million miles away emitting power in all directions and we lie on a sphere of radius 93 million miles and still 1000 W/m^2 is our share. You can imagine the enormous output of energy from the sun. 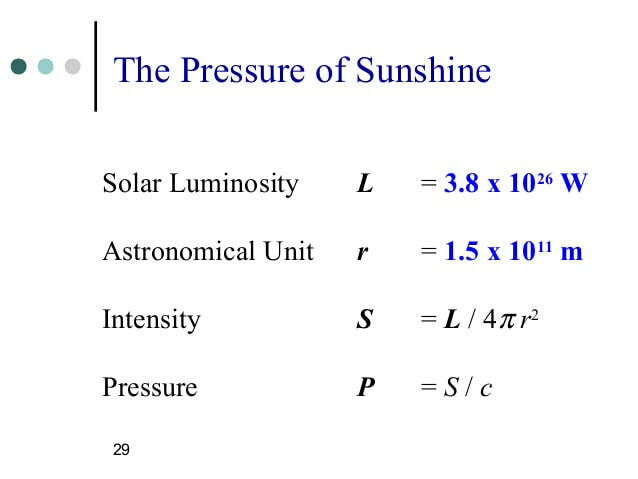 You can estimate the electric field that comes with the sunlight given the energy density. It is roughly 1000 volts per meter. This means that if the field were uniform, there would be a potential difference of 1000 volts across one meter. But the field is not uniform and varies randomly in space and time. 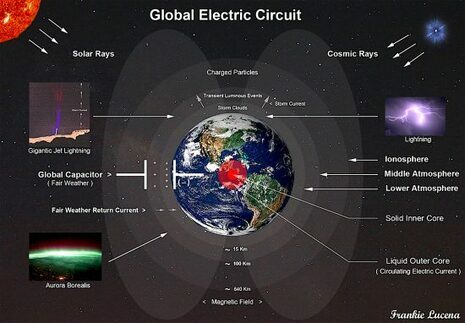 As we'll see in the next section, the earth does have a uniform electric field of 100-300 volts per meter between the ionosphere and surface. Classical or Newtonian Physics divides the physical world in particles and waves. Only quantum mechanics resolves the two as ONE. Particles transport energy (and momentum) with their mass and motion from one point to another in space. Waves transport energy from one place to another without mass (via frequency resonance and amplitude). **Coherent Energy is photons or particles going in the same direction with the same phase or angular relationship (entanglement). Giving rise to a constant waveform through space. Coherent Energy works against Entropy creating order and even life (Negentropy or Syntropy). Also stored energy and Gibbs Free Energy are coherent energy as that is energy that CAN be used for work. Incoherent Energy is photons and particles going all in different directions with no phase relationship. This is decoherence/Entropy. This is usually thermalized energy that CANNOT be used for work. Photons Can Do BOTH but they do it without Mass Yet With Motion and Momentum! Electromagnetic waves, whether viewed classically or in terms of quantized photons, are not affected by static electrical or magnetic fields. They have no charge. Nevertheless, they do exert electrical and magnetic forces on charged particles and magnetic particles. Viewed classically, they consist of nothing but electrical and magnetic fields propagating through space, so it’s entirely appropriate to call them electromagnetic waves in ONE respect. Photons are little units of light -- they are the original "quanta" of quantum mechanics. Their existence was hypothesized to explain the details of the photoelectric effect -- photons with enough energy can knock electrons out of materials. Since then, photons have been found to play a central role in the explanations of many physical phenomena, from explaining how much heat is radiated by hot objects to modern quantum cryptography and quantum computing, quantum biology, quantum optics AND MORE!! We therefore have two very different ideas for how light works -- as waves in the electric and magnetic fields, and as motion of particles -- photons. This pair of explanations is called "wave-particle duality" and is a recurring theme of quantum mechanics. Depending on the experimental situation, light acts as a wave or as a particle (but never both simultaneously). 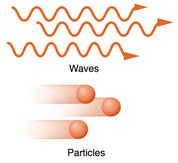 Weirder still -- static electric and magnetic fields also exhibit wave-particle duality. The collision of a charged particle with another (repulsive or attractive) can be modeled as the exchange of photons and you get the same answer as if you had calculated everything with just the classical fields (in the limit that the classical calculation applies -- slow incoming particles). The quantum calculation involving the exchange of photons is more accurate in describing actual collisions at higher energies. Why doesn’t the electric field of a charged object just zoom away at the speed of light? It turns out photons which make up a static electric or magnetic field are "virtual" -- their energy and momentum doesn’t satisfy the relationship for "real" photons -- E=p*c (E is energy, p=momentum, and c is the speed of light). The virtual photons are constantly emitted and reabsorbed. A charged object with an electric (and possibly also a magnetic) field is surrounded by an entourage of photons, constantly being emitted and reabsorbed. Photons, real and virtual, are emitted and absorbed by charged particles, even though they are not charged themselves. They only interact with charged particles, and not with each other. That’s why photons don’t interact with magnetic fields -- the photons which make up the magnetic field are not charged so other photons cannot interact with them. Charged particles are sources of these fields. The way in which charged particles give rise to fields is captured in the Maxwell equations. Charge itself gives rise to a 'divergence' in the electric field. We have come FULL circle and completed the cycle. This whole video is one big wave that repeated itself. OK , now it is time to WAVE goodbye!! But we will begin another Cycle of Learning Soon! Most PEMF devices can be understood with basic Classical Electrodynamics. Though it is good to keep in my some of the fundamental quantum ideas we discussed pertaining to light. Poetic Ending To Coming Full Circle - The Enso (pictured above). In the art of calligraphy, the circle is a brush stroke done in one movement. This circle, called enso is perhaps the most poignant image in Zen training for “coming full circle”, or enlightenment. The stroke is suggestive of flow, done with the brush held not too loose/not too tight. It is done in one movement and the stroke embodies both spontaneity and disciplined form. The circle itself is not complete, yet at the same time it expresses totality and completeness. All that occurs in our life takes place within the fluid boundary of the enso. The empty space within the circle allows for all experience to arise. The incompleteness of the circle suggests that our lives are never complete and that the flow of our experiences are never final, never finite. We complete the empty circle by living, engaged in tasks and in relationships that have no finality. This no finality itself is infinite! The circle is not perfect. The single sweep of ink is natural–done by hand– and so includes imperfections. The form of the stroke is inevitably imperfect, just as any form–bodies, ideas, plans, marriages–are inevitably imperfect. This imperfection is part of the design of the tea bowl used in Japanese tea ceremony. The bowl is beautiful if it has irregularities, aberrant marks, is rough-hewn and is made of inconsistent surfaces. We drink from the imperfect cup, the bowl that naturally is slightly out-of-balance. Yet at the same time the bowl, the enso, points to wholeness, however momentary. It points to the possibility of a moment, within the almost-full-circle, being complete, just as it is. The taste of the tea, the sound of the mourning dove, the bang of the recycling truck, occur within the empty circle. So the perfect and the imperfect are expressed together. Whatever arises is perfect just as it is, and imperfect just as it is. This is how we practice in the midst of the open circle. When there is an electromagnetic wave in any region, there is stored energy there. The energy stored in the electric and magnetic field is the same for capacitors and inductors as it is for EM waves in free space. The energy depends only on the field at any point, it does not matter what the source is. For example, it does not matter if E is produced by static charges or by a changing magnetic field. It is like saying that the kinetic energy of a soccer ball is 1/2mv^2, whether you got the velocity by rolling it down a hill or kicking it. The magnetic force is much weaker than the electric force, BUT the energy densities are exactly the same. Energy Density is time dependent and space dependent. Average value of sin^2 is 1/2 over a full cycle. You can sit in one place and see the energy density average over a full cycle (period). OR you get the same answer if you average the energy over a full wavelength at a fixed time. 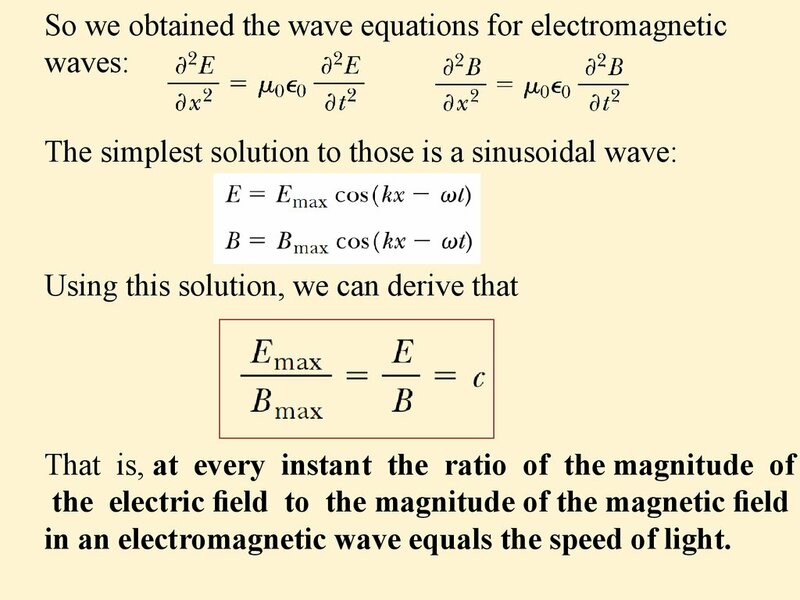 In order to calculate the energy carried by any electromagnetic wave, you need to know the magnitude of the electric and magnetic fields that compose that wave. Specifically you use these magnitudes to calculate what's known as the energy density of each field, which is the amount of energy stored in the field per unit volume. Then you can combine the energy density for both fields, solving for the total energy per unit volume within the wave overall. But since you know that strengths of the electric and magnetic fields are directly related, you can substitute the electric field magnitude for the magnetic field magnitude, and vice versa. This lets you come up with the energy density terms that encapsulate the energy in both fields, with fewer variables. So again, here's the calculation of the speed of light that Maxwell found, and the constants that it simplified down to. You can take the energy density equation and substitute the magnetic field magnitude B, with the electric field, times the square root of the constants. 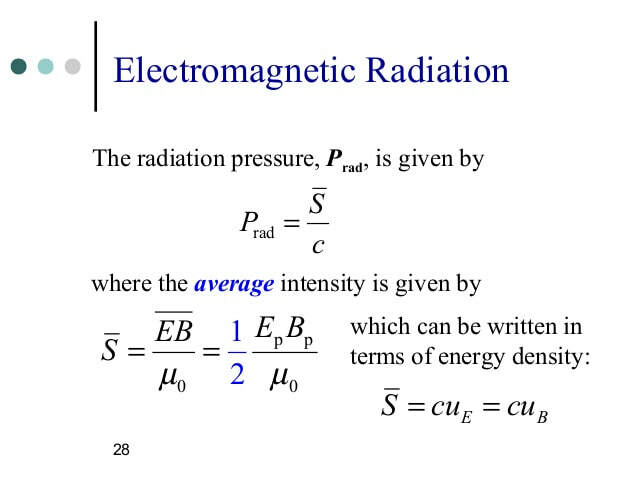 With this simplified energy density equation, you can then substitute the electric field magnitude for the speed of light and the magnetic field magnitude. 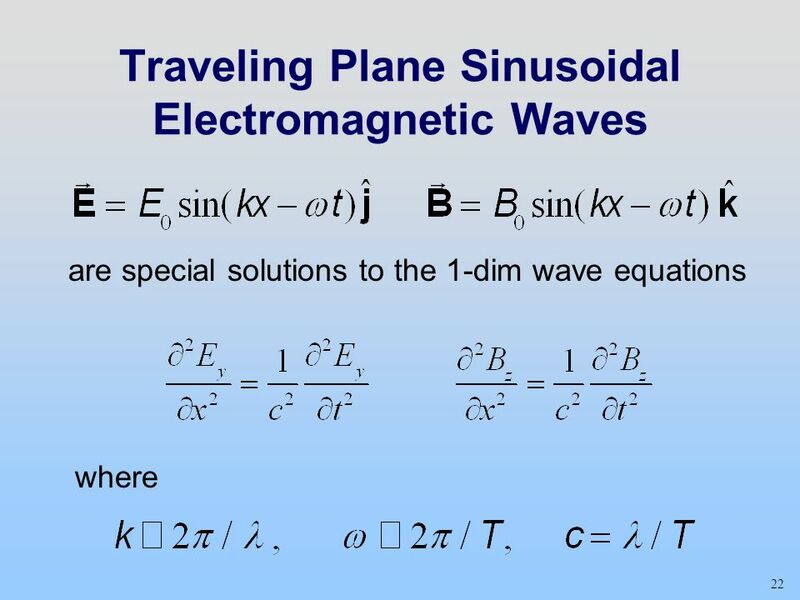 These equations give the energy density of an EM wave at any point during its propagation. One last important measurement of delivering energy is intensity, which is the energy transported by a wave per unit time, per unit area. Mathematically, the energy delivered is equal to the energy density times the volume of space in which the energy is transported over a period of time. You can then replace energy density with one of the simplified equations we used earlier. So the volume of space encompassed by the wave is equal to the unit area times the distance travelled. After cancelling out like terms, you're left with an equation that tells you how much energy you have per unit area based on the strength of the electric field, which you can also replace with the magnetic field. ​A lot of math, I know, but the vast knowledge of electromagnetism that we have today and the doors it has opened into the fields of relativity and quantum theory, are all based on the theories that Maxwell and his predecessors developed. Albert Einstein praised Maxwell specifically for his contributions, but it was the combined effort of revolutionary minds like Gauss, Ampere, Faraday and Maxwell that we have to thank for our understanding of the interaction between electric and magnetic fields. Now in the absence of charges and currents, we find Electric and Magnetic fields can continuously reinforce and propagate one another. The WAVE equations come from setting the charge and current = 0. A Changing Electric Field induces a magnetic field (something Faraday had to ADD to Ampere's law to account for CHANGING currents (like PEMF therapy!!). ADD TO This Faradays' Law that a Changing Magnetic Field Induces an Electric field and you HAD the basis for how EM waves propagate in space (as we'll see). ​WHICH than in turn creates a time varying electric field... (leads to 3D wave equations describing EM waves). For the purpose of studying waves, let's focus on free space where both the charge (or charge density p) AND current (or current density j). That is Q = I = 0 (or p = j = 0). In the static case that would mean no E or B as per Coulomb or Biot Savart because both fields drop off by 1/r2 or faster. But we find that E and B can survive on their own, untethered from charges and currents. The reason electromagnetic waves can survive in a vacuum far from charges and currents is that once you've got E and B fields somewhere, they cannot just disappear due to the energy they contain. A change in one induces the other and it keeps going on forever or until it is absorbed.The E and B fields just keep going back and forth as we'll see. Without charges and currents the Maxwell equations become very symmetric between E and B. Neither has a surface integral. And the line integral of one is proportional to the rate of change of flux of the other. Compare below to previous Maxwell's equations. All we have done is set p and J to zero (charge density and current density). So in free space WAVES CAN propagate because a changing electric field creates a changing magnetic field and in turn a changing magnetic field creates an electric field. ​The equations above constitute a set of coupled first order differential equations for E and B. They can be decoupled by applying the curl to both equations on the right.